Belts have an internal adjustment of 2 ½” up or down from actual size ordered. Example: belt size = 36", can adjust down to 33 ½” and up to 38 ½". 2 1/4" Black leather dress belt with red lining. Belts are available in 2” increments from sizes Sizes 32-50 and have an internal adjustment of 2 ½” up or down. 2 1/4" Black leather dress belt with your choice of chrome buckle. Sizes 32-50. Chrome-plated buckles for 2.25" kilt belts. Buckle has smooth center. Choose from Thistle, Celtic Knot, or Thistle/Celtic designs. 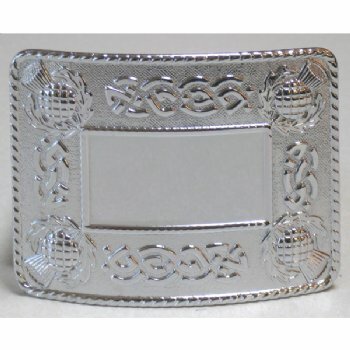 Chrome Thistle Medallion Buckle for 2 1/4" kilt belt. 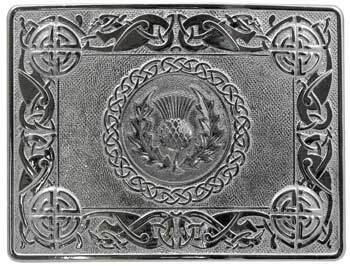 Large pewter Pipe Band design. 9 Pipers, Drum Major, Bass Drummer, and three Snares. Large "cut out" pewter thistle measuring approx. 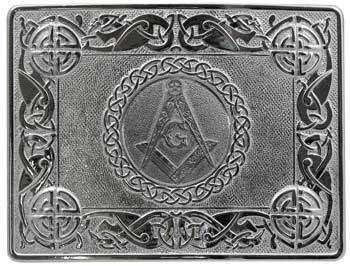 5 x 3.25"
This is one of the most beautiful belt buckles around! If you have seen other belt buckles by Don, you know the quality is outstanding. Large pewter Double Lion design.